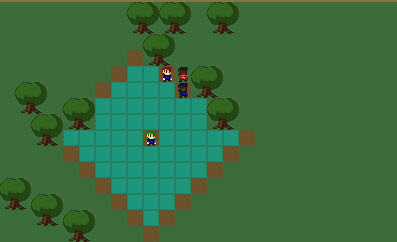 A simple Tactics-RPG engine made in GameMaker:Studio ages ago for a game jam; it ended up never being used and has collected dust since. But I still feel it might be useful to someone out there, so therefore I release it in a revised port with some cleanup and bug removal in place! Zoomed-in battle screens like the GBA Fire Emblem games! Easily separated code with comments, descriptive variable names, and descriptive function names! Instance-based data management! You can handle anything such as status effects or buffs with standard variables! Attacks use control objects; you can do just about anything with your attacks! Very lightweight and easy to customize! Comes bundled with Pixelated_Pope's free palette swap shader already integrated! Change anything from armor to hair color on the fly for unit variety! Contains a large number of random names! Welp, there's not really much else I can say. Try out the demo and see if you like it, I guess. Great game! I'm looking into making my own Turn based strategy game and this is a solid base to build it :)^^. How long did it take you to code this o.O. I would like to know if we can run it on GMS 2 ? I don't remember anymore, but it's a pretty basic engine made for a game jam, so probably less than 7 days. (Depends a bit on how much I cheated by reusing code from my old projects... which I wouldn't disclose even if I remembered :P) I tried importing it into GMS2 right now, it works just fine for me (I'm on IDE v.2.2.0.343, runtime v.2.2.0.258). Do you still support this engine? I'm quite a beginner at GM:S and understanding what is going on is really complicated for me. Hopefully, this would suit for beginners, and this is the only viable thing i can find about tactical game engines in GameMaker. I'm thinking of buying and using this as a base for a tentative Super Robot Wars engine, which means most of this engine's core stuff might be changed to implement a similar gameplay style of the SRW series. If i were to plan to make a public engine and release it for free for the public, am i allowed to release a engine that takes this as a base? Doesn't actually matter anymore. I've got to know SRPG Studio rather than caring about this unfinished thing. Thanks anyway. Fair enough, an engine that's 100% made for what you're trying to do is always gonna give better results. I'm sorry for being ignorant. I just have realized it is not nice to do a free edited version of a cheap .gmk file of 2 bucks. I want to apologise for what i have said for being unrespective months ago. When i said i wanted to make a "fork" or edit of your own engine and publicize it, i did not mean of actually keeping your assets. I assume you don't want me to publicise an edited version of your code as an edited engine. Could it be okay to use the engine privately with a devteam and release it without the source code included? Apology accepted... it's been like half a year, I'd forgotten all about the thing by now, don't worry :P Just learn from it and be careful about saying too harsh stuff in someone's face next time, I guess. You will not BELIEVE how overjoyed I was to find an engine like this! 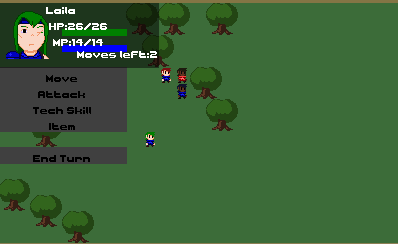 I'm working on my own little TRPG, and I had thought I'd have to build it all from scratch. I'm certainly going to buy this engine, along with a little more of your stuff later down the road. All of us good coders learned coding by copying existing stuff at first before we realized what it did, so don't fret too much about not doing everything yourself. Do it when you're ready for it, when you feel like you NEED to make everything from scratch to get it exactly the way you want it. Code doesn't rust or rot, you can reuse it as long as you feel it does what you need it to do. Great game! I'm looking into making my own TRTS my self, so this was a great demonstration that Gamemaker has what it takes! Other than the shoty graphics, small resolution screen and no win state/menus per say (though that's the demo idk how the paid version plays) This was a really charming example. Best of luck and I will keep this on my watchlist! is there a work around for this error cause I get it too. I was thinking of buyint it but this problem prevents me from doing so. The old GMC has been archived, but hopefully the info/code already in the topic helps. Thank you for the reply. I went ahead and bought your script. I wont be using the shader at this time, do I just delete the shd_pal_swapper ? Should I also delete the Palette Swap folder under scripts? Deleting the shader itself should be enough (the help scripts won't do anything as long as you don't call them), and then just make sure you remove/comment-out any script calls that would use the system (e.g. shader_set()/shader_reset() pairs in the draw event of map & battle units)... it's never a good idea to leave in references to a resource that doesn't exist anymore. Edit: Oops, forgot to mention, I'm running this on Windows 10. Interesting... I'm running on Win10 myself. That error is because the shader than handles palettes didn't compile properly, and that in turn might be a problem with your graphics card running ShaderModel2 instead of ShaderModel3. ShaderModel3 is so ubiquitous nowadays I don't even check whether the shader compilation worked properly in the engine, but that might be a good idea after all. btw...the usual thing is directx9 just isnt installed.